On April 15th the last sardine cannery in the United States of America officially closed. In its hayday, the sardine fishery industry had hundreds of sardine canning and packing facilities in operation. Over the years that number dwindled until there were just a small handful left. The last of these was the Stinson Beechcliff Cannery in Prospect Harbor, Maine. The cannery was owned and operated by the Bumble Bee Corporation. Photographer William Brehm visited the facility less than a week before its closing for the purpose of documenting in photographs the day-to-day operations of a once thriving industry that is no more. William was doing this for the State of Maine Museum and Archive. Images created that day are being donated to the Museum. 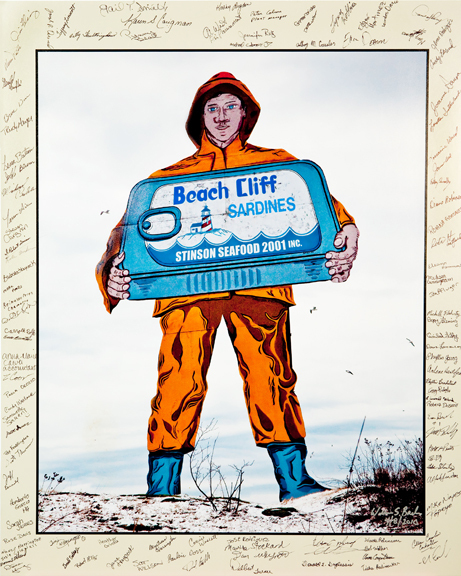 Among the many images created was an image of the 60 foot tall Stinson’s Man which stood at the entrance to the cannery. A 24×30 inch photograph of this image was printed with a 2 inch border around all sides. The entire staff of associates and management personnel then signed the photograph in the border area. It was then handed over to Kate McBrien the Curator of Historic Collections at the Maine State Museum. 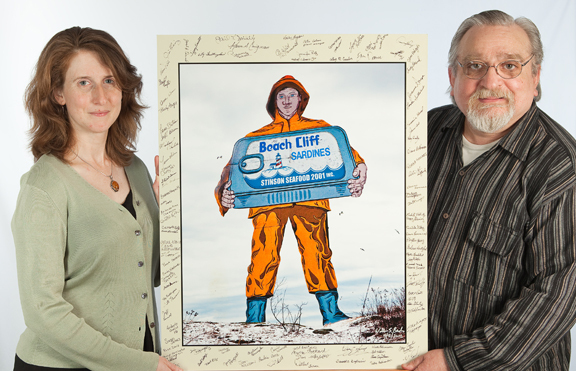 Below is a photograph of Ms. McBrien and William Brehm making the exchange as well as a photo of the actual print itself.